As a full-time editor for Writers Digest books and frequent conference presenter, Chuck Sambuchino has his finger on the pulse of the publishing industry, especially when it comes to literary agents. Each year, Sambuchino updates, revises and includes new articles in the Guide to Literary Agents, which makes each edition feel like a brand new book. Any writer looking to find a literary agent should have a copy of the 2010 Guide to Literary Agents . It is more than just a market guide with the contact information for agents. The first four include informative articles by Sambuchino and other writing professionals with topics like, how to research an agent, how to write a good query and synopsis, negotiating your book contract and marketing your book. Most writers understand that acquiring an agent is an important and in some cases necessary step to getting their book published. 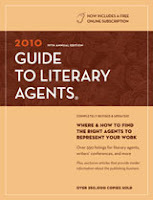 In the 2010 Guide to Literary Agents , Sambuchino provides the tools needed so writers can all find the right agent. I expect to spend some time with the guide early in 2010 as I decide where to pitch/query two very different novel manuscripts. This part is harder than writing a novel. Query Letters, Snynopsis, and Sample Chapters...oh my! Thanks for the review! It was very helpful and now I know what to expect before making that purchase. Looks like I'll be diving into it soon. Thanks again!